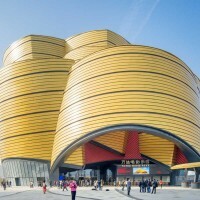 Stufish Entertainment Architects have recently completed the Wanda Movie Park, the world’s first indoor movie theme park in Wuhan, China. 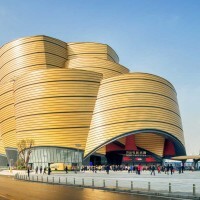 Stufish Entertainment Architects have completed the world’s first indoor movie theme park in Wuhan, China. 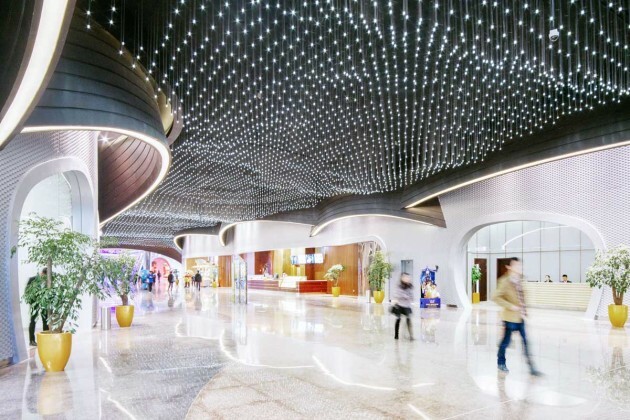 The $690 million Wanda Movie Park, designed for client Dalian Wanda Group, is a multi-dimensional and multi-sensory experience spread over 100,000 square metres. 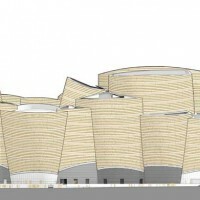 This spectacular building houses six film-related ‘ride’ attractions, including 4D and 5D cinema screens, flight theatre, immersive and interactive live performances and a space theatre. Built to complement the advanced technology within the park, Stufish’s thoughtful design showcases Wuhan’s rich local heritage. 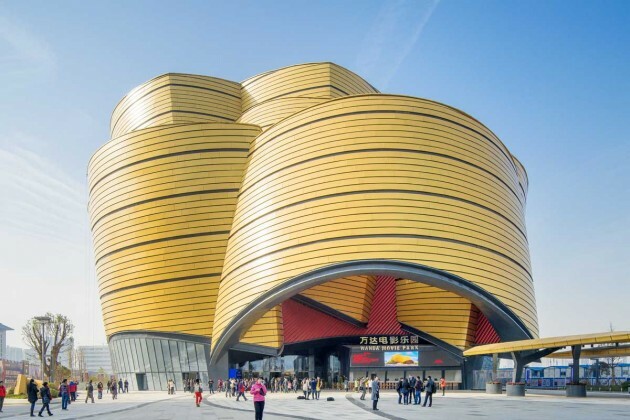 Wanda Movie Park is nicknamed The Golden Bells, as its design draws inspiration from a 2,000-year-old local relic called Wuhan Bianzhong bells, a cultural artifact from the Han Dynasty. 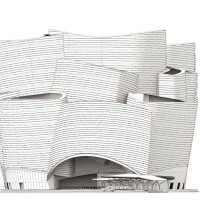 Architect MAciej Woroniecki describes the arrangement of the bell structures as ‘an architectural cacophony – a static motion expressing a joyous tone’. 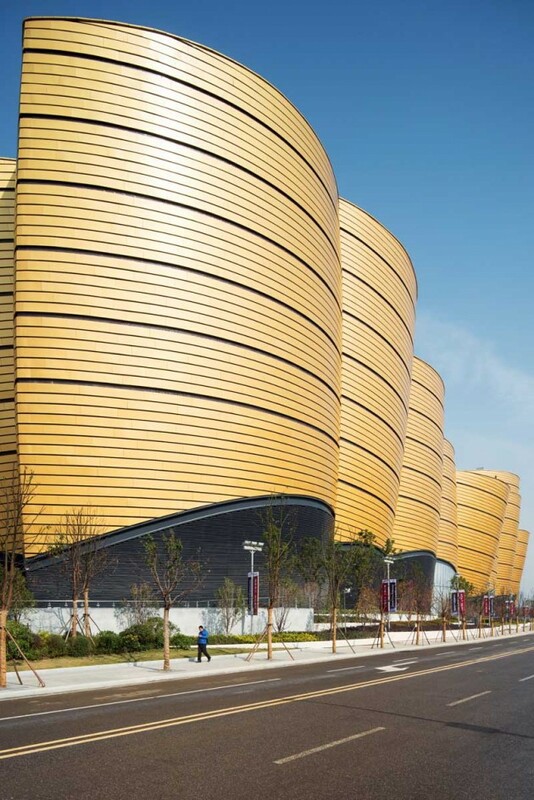 There are 24 bells in total, and each undulating shape is covered in bespoke geometric aluminum panels; all 11,000 of the gold panels are covered in a fluorocarbon paint that allows the cladding to self-clean as it rains. Strips of LEDs fill the 100 mm gaps in between the horizontal rows of paneling. 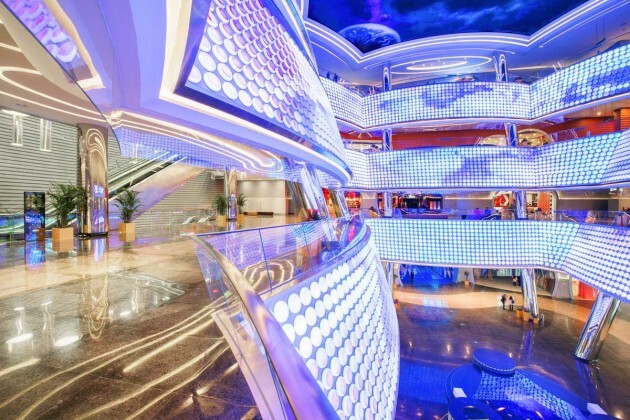 They wrap around the massive, 60m tall bell shaped structures and make Wanda Movie Park glow vibrantly at night. The scheme’s landscaping was also carefully considered, as its terraced planting, outdoor seating, and water features reference the agricultural practices of the Hubei province, in which Wuhan is located. Glazed areas at street level provide double height shop fronts on the lake and generous views out from the various dining and retail facilities within. 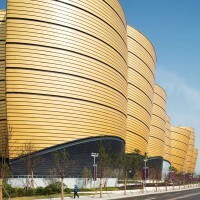 The building’s only entryway, which is positioned in a hollow bell, is just beyond a large column-free canopy, a 32m tall x 34m wide x 18m deep cantilevering structure. 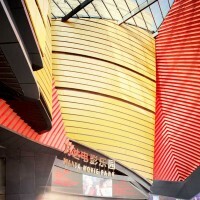 The geometry of Wanda Movie Park’s exterior facade extends to the internal finish. 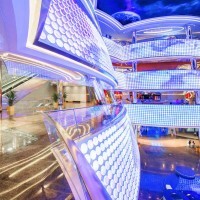 The inner facade that spans three floors is made of animated LED discs set to create an interactive digital platform. 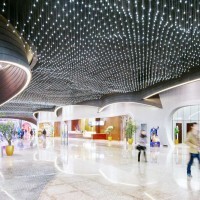 This choreographed theatrical lighting enhances the ad-hoc energy of atrium terracing, jutting escalators and bold signage. Stufish’s designs for Wanda Movie Park are undeniably extravagant, but they match the intense ride content produced by pioneering visual effects companies such as Industrial Light & Magic (behind the Star Wars saga) and Pixomondo (behind Game of Thrones). 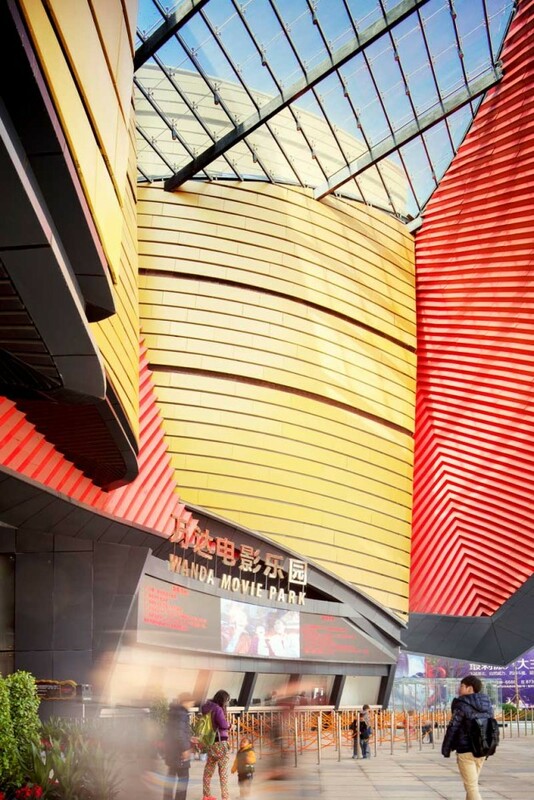 Located on Shahu Lake, the Wanda Movie Park is the eastern anchor of Dalian Wanda Group’s ‘Wuhan Central Cultural District’ development – a city-wide programme to provide waterway connections between Wuhan’s six lakes. The Cultural District includes a programme of offices, residential, cultural buildings and shopping malls along a 2km canal-side site. To the west, the district is anchored by Stufish’s other recently completed building, The Han Show Theatre, which overlooks Donghu Lake. Notably, Stufish took on the project in 2010, when found Mark Fisher was still alive. 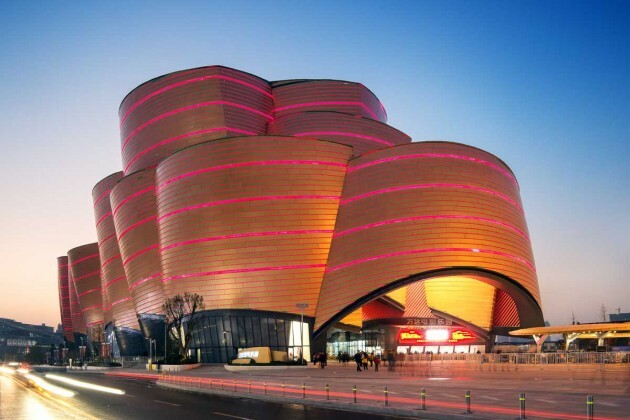 Fisher and his team worked closely with the client, designing a viable building alongside their vision of innovative technology and exhilarating spectacle. However, he passed away in 2013 – a year and a half before the projects’ completion. 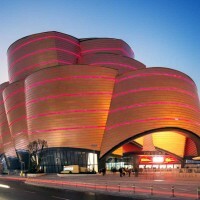 As such, the launch of The Wanda Movie Park and The Han Show Theatre is a significant and sentimental achievement for the design studio.